Fun cupcake ideas are easy for anyone, from novice to expert, to incorporate into their next decorating project. Whether you get your idea from the season, party theme or a nearby holiday, you are sure to find an idea or two that fits your skills. One fun way to decorate a cupcake is to highlight the flavor of the cupcake in the decorations. This means adding a mini-chocolate chip cookie to a chocolate chip cupcake or perhaps a lemon wedge to one iced in lemon frosting. Creating a rainbow colored frosting is an impressive, fun way to decorate a cupcake for any occasion. It also requires few skills to pull off. Take one to three complimentary food colors in a liquid or paste form, and stripe them down the sides of a parchment pastry bag fitted with a large star tip. Fill the bag with a light or white colored frosting and then pipe onto the cupcake. The frosting will pick up the color of the dye on the sides of the bag as it is squeezed out, making the pretty effect seen in the picture at the left. Pets make excellent inspiration for a fun cupcake. 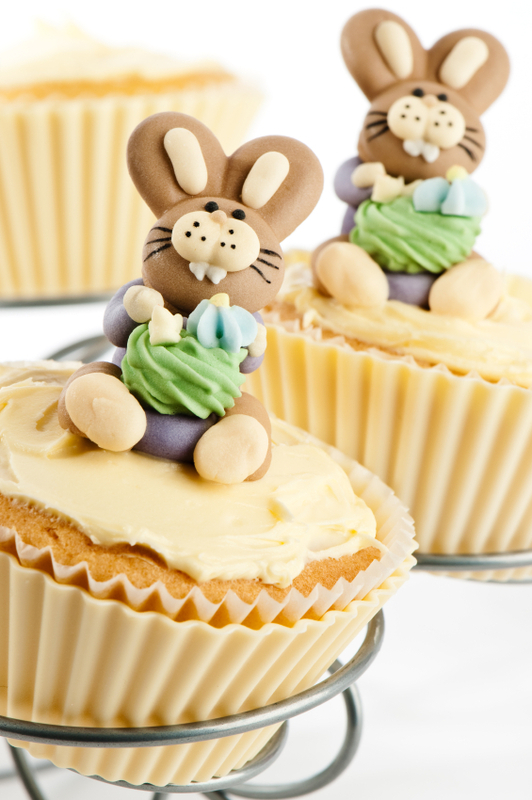 Use buttercream icing to make your dog, cat or even bunny's face on the top of a cupcake. These are perfect for a child's birthday party. Place small candies on top of cupcakes to make many designs, such as bugs or butterflies. Use gummies, licorice, jellybeans, candy coated chocolates and sprinkles to achieve the look you want. Adults and kids alike will be thrilled to enjoy a festive miniature "gift" of a cupcake. Use ganache or pourable fondant to coat the entire cupcake, and then cut out a fondant or gum paste ribbon to top the cupcake. With a little bit of creativity, you can carry out just about any party theme on a cupcake. Candies and a little bit of artistic skill make these pirate cupcakes perfect for a summer party or birthday party. While these are made using regular frosting, you can also cut out fondant shapes that fit any theme and place them on top of cupcakes. Royal icing creates the life-like figures on top of these barnyard cupcakes. Draw figures on waxed paper and then turn it upside down (so the marker does not get onto the icing). Trace the figure with black royal icing and then flood each area with royal icing that has been thinned slightly. Allow it to harden, which usually means drying overnight or longer, before placing on top of the cupcake. Modeling gum paste and sculpting fondant create excellent figures for placing on top of a holiday-themed cupcake. For a fun twist on a regular cupcake wrapper, try putting the cupcake into an oven-safe coffee mug in either a plain color or a matching theme, like the Santa cupcake at the left.